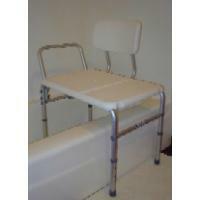 McKesson Performance Bathtub Transfer Bench Model 16-7808, Avi Depot=Much More Value For Your Money! Cardboard Packaging Show Signs Of Wear-BRAND NEW ITEM!!! Arm Type: Detachable Arm Rail. Increases safety and convenience getting over bathtub wall and during bathing. Reversible backrest fits bathtubs with left- or right-side faucets. Wide base helps distribute weight over large area. Legs adjust in 1/2 inch increments with push-buttons to a height between 16 inch and 20 inch. Suction-cup rubber tips on two of the four adjustable legs help grip wet surfaces.